8 1/2 x 17 Customized Rolled Scroll | Customized Scrolls | Scrolls Unlimited, Inc.
Do you have more to say than what will fit on an 8 1/2 x 11 rolled scroll? This would then be the perfect size for you! Extra pages can be added. 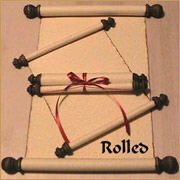 The 8 1/2 x 11 Rolled Scroll Storage Box is the perfect fit for this scroll.